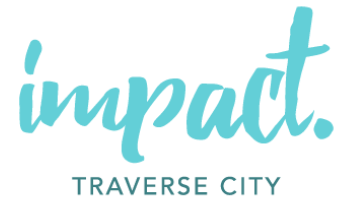 Answers to All of Your "What's" and "Why's"
IMPACT 100 Traverse City collectively funds transformational grants in the areas of environment/preservation, education, arts & culture, family, and health & wellness in the five county area including Grand Traverse, Antrim, Leelanau, Benzie and Kalkaska. Impact 100 is a successful global philanthropy model created by Wendy Steele in 2001 in Cincinnati. Her concept is simple and powerful: Gather a group of dynamic women together to each give $1,000, with the goal of significantly impacting one local organization. At least 100 women give $1,000 each. This money goes into a grant fund that is given away in our five county region through grants of at least $100,000 each. Grants can be awarded in Education, Arts & Culture, Family, Environment, or Health & Wellness. The grants are awarded based on a vote of the membership at our annual meeting in October. Every woman who gives $1,000 is a voting member. Our ultimate goal is to gather at least 500 members, so we can give away one $100,000 grant in each of the five focus areas. Impact 100 is run entirely by members who volunteer their time and resources. 100% of the membership donation is awarded to the grant recipients. All donations to Impact 100 are tax-deductible. A franchise. A staffed organization. An affiliated membership. Still want to know more? We're glad! Click the button below to learn about the Impact 100 Model.